In Ukraine there are many Cambodian students studying their different degree programs at different universities. Students from Cambodia has brilliant academic record in Ukraine and that is why Ukraine always welcome students from Cambodia. Cambodian students are not that good at English normally so for the first year they study at preparatory faculty for Russian language with some science subjects. There are some students from Cambodia so they study their degree programs directly in English medium of instructions without studying at preparatory faculty. Students from Cambodia prefer to study at state owned government universities in Ukraine. Some Cambodian students are study at state medical universities and some at business schools in Ukraine. Those Cambodian students who want to come to Ukraine for 2019-2020 intake are most welcome for their admission process in Ukraine. Admission process is quite simple and easy and the main plus is free merit for all international students. According to process students from Cambodia scan their secondary school certificate with travel passport copy by scan in the Email of admission office mentioned below. These admission documents are checked by the admission team and the checking duration is maximum 2 days. Once the decision is made for the admission,All eligible or ineligible students are informed by Email. Those Cambodian students who are found eligible ,They are provided with bank details for the admission fee and they transfer their admission fee.After transferring the admission fee eligible applicants scan the admission fee receipt to the admission office for record. After receiving the admission fee admission office forward the documents to the Ministry of Education,Ukraine for the issuance of official study invitation for visa process. Ministry of Education,Ukraine takes to 2 weeks and the official study invitation is handed over to our admission staff. First admission staff scan this invitation copy to the applicant and after that it is couriered to the applicant’ home address.The delivery time at student’s address is 5-6 days. Ineligible applicants are asked to provide more supporting documents for their visa process. Once the original study invitation is received by the student in Cambodia,He/She prepares the following documents for the Embassy. Cambodian students obtain their visa from the Embassy of Ukraine in Vietnam as this Embassy is assigned for the issuance of student visas for Cambodian nationals. 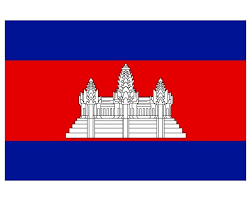 A confirmation of admission is sent to the Embassy in Vietnam for the admission of Cambodian citizen. We strongly advise all international students that must scan us your visa copy with air ticket minimum 3 days before departure as admission office has to prepare the reception documents for the immigration. Our admission staff receive the international students at airport and manage their accommodation and lectures. Interested Cambodian students may contact us through the following details for their admission process in Ukraine for 2019-2020 intake.